When we magnify this picture, the soldiers are clearly visible, directing the activity. In the entrance to the War Gallery, we saw that military equipment was present at the Mt. Carmel Center from Day One. Here's what they had lined up on Day Two. 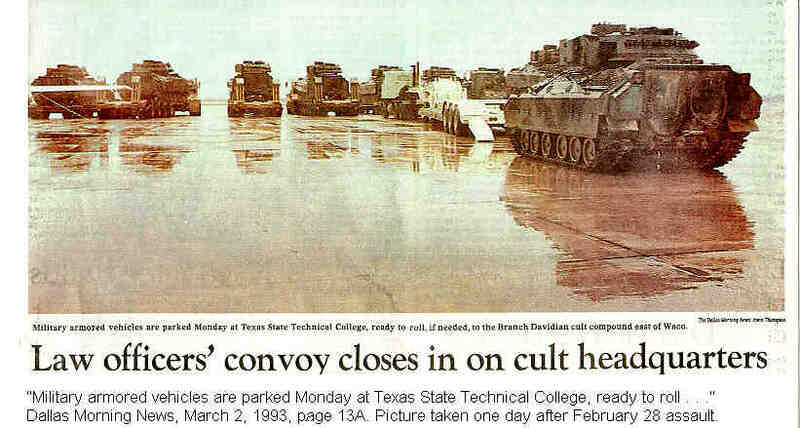 Also see The Dallas Morning News, March 3, 1993 for more equipment photographed on Day Two. On July 30, 1992, one of David Koresh's business associates, Henry McMahon, received a visit from several ATF agents. The subject of the inquiry was recent gun purchases by David Koresh. McMahon, himself a gun dealer, phoned David Koresh while the agents stood in front of him, and told Koresh about the ATF inquiries. Koresh invited the ATF out to inspect his premises and his guns. According to Mr. McMahon's testimony in the 1995 Congressional hearings, when he relayed Koresh's invitation, the ATF agents declined to accept the invitation. The legality of David Koresh's guns were, therefore, never the issue. The ATF could have gone out and inspected his guns at any time. Had the ATF not wanted to accept Koresh's invitation to come out to inspect the guns, and had the simply wanted to arrest him on some pretext, they could have apprehended him when he was out of the Mt. Carmel Center. But ATF claimed that David Koresh never left the property, and therefore a raid was necessary to apprehend him. "To say that he never leaves that place is ridiculous. He is always out everywhere. Everybody and their dog see him and many of the people out there. But I guess they are just trying to cover themselves because they are going to be in big trouble — hopefully," she said. David Koresh used to work on car engines at a repair shop owned by the Davidians, which was about five miles from the Mt. Carmel Center. He was also "seen dining and drinking at Chelsea Street Pub, a popular West Waco eatery, at least twice in the past six weeks," according to the The Waco Tribune-Herald. There was no need for an assault, no need to endanger ATF agents, and no need to endanger peaceful civilians. What was at issue? The issue seems to be that the February 28, 1993 raid and ensuing siege provided the US the opportunity to test, for the first time, the "National Response Plan." (Treasury Report, pg. 152 for description). It is impossible to get a plain English definition of the National Response Plan" from the Treasury Report. The nature of the plan and its purpose must be inferred from the obfuscated verbiage. 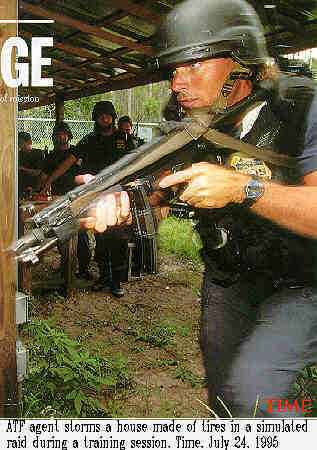 An ATF agent storms a house made of tires in a simulated raid during a training session. Time, July 24, 1995. A chart of the National Response Plan's organization appears on Treasury Report, pg. 63. At the top of the chart, we see that control of the plan is vested in the "National Command Center," which was ostensibly under the command of an ATF agent (Treasury Report, pg. 152). At the bottom of the chart, we see other federal, state, and local law enforcement agencies, the Department of Defense (DOD), with National Guard support. Thus we are asked to believe that an ATF agent sits at the top of the organization board (in command) and that the Department of Defense is at the bottom of the organization board. It is of course unbelievable that an ATF employee would be taken seriously if he tried to issue directives to the Pentagon concerning the deployment of Pentagon troops. The picture of a four star general, having climbed to the top of the military chain of command by decades of careful politics, taking orders from Treasury Department functionaries is not credible. Had this organizational chart borne semblance to reality, we surely would have seen "DOD" box at the top of the chart. What was the purpose of the plan? The National Response Plan "sought to define ATF objectives, policies, and procedures to ensure a coordinated response and rapid deployment of ATF resources to situations that exceeded the capabilities of a single field division," (Treasury Report, pg. 62). According to the schema, DOD National Guard units could be called up to assist the ATF. But the ATF is essentially a tax-collecting agency. What "situations" could exceed the capabilities of an ATF field division to collect taxes? Clearly any situation that required the power of the DOD National Guard would be a major civil upheaval. The NRP is a preparation for armed confrontation between the US government and US citizens. Prior to about 1999, small sectors of the population of the United States believed the Second Amendment of the US Constitution was designed to enable the people to resist the power of the government. An armed and "well regulated" (trained) populace, it was thought, would prevent the government from devolving into a tyranny. The government could not enforce unjust laws against the populace if the populace were armed to resist that force. A number of groups developed paramilitary organizations, called themselves "militia," and practiced paramilitary drills. Between nations, the contemplation of conflict often leads to an arms race. Within the US, the possibility of conflict with the general populace had the same effect on the government. To meet the threat of insurgency, the government developed riot weapons, "crowd control" weapons, and weapons of mass destruction unnecessary for conflict with external enemies. It also developed procedures and organizations capable of meeting the "threat" of a recalcitrant populace. According to Wikimedia Commons, this photo was taken by the BATF on April 19, 1993. "Threat?" Yes, indeed. To the authoritarian mind, refusal to submit to the "authority" is equivalent to an attack on the authority. Once the authority engages a target, the conflict must always result in utter surrender or death of the target, and the force of authority is escalated until one of those results is achieved. At the heart of this conflict is a question at the very heart of the US Constitution: Who is the sovereign? Does the government exist by permission of the people? Or do the people live how they live and do what they do only with permission from the government? If the people and the government have different answers, conflict is inevitable. The National Response Plan was one of the government's answers. Under that plan, when the BATF found itself facing a situation beyond its control, it could escalate the crisis through the organizations of limited force (police) until the action reached the body of unlimited force, i.e., the US military. Another necessary element was the control of "Psychological Operations," as it is called in the military. The government must control the news media and the emotions and attitudes of the people at large. The Report of the Department of the Treasury outlined a part of the Plan, designed it says, to meet the threat of "terrorism," homegrown or otherwise. As with nuclear bombs, a weapon without a test is useless. The NRP required testing in the presence of real courts, real lawyers, real news media, and a real population. In addition, the Branch Davidians were already on the national enemies list. David Koresh had divorced Christianity from a dependence on the modern nation of Israel, and he was an extraordinarily active missionary, mailing out tapes of sermons, traveling abroad, and preaching his message. He was also remarkable effective in persuading new recruits to join his movement. Would Americans tolerate a massive troop buildup against a religious community? To meet this problem, the troops used the strategem called "false flag." If the government could appear to be the victim rather than the aggressor, all would be well with the people. Apparently, the plan was to assault the Davidians and suffer casualties. Since the Davidians might not succeed in killing some of the agents, snipers were included in the assault force to ensure casualties among the government forces, giving out the story that the Davidians had killed cops in the line of duty. And like so many false flag operations by so many other governments in history, it worked perfectly. The ATF chose the Texas State Technical College (TSTC) as site for the command post of the operation. The sheriff's department had previously gotten cooperation from the airport manager. (Treasury Report, pg. 55). The McLennan County sheriff's department was lined up to "provide other support functions." (Treasury Report, pg. 79). the US Marshall's Service (Treasury Report, pg. 112). By March 2, 1993, 400 local, state, and federal law enforcement officers had converged on Waco, according to the Dallas Morning News of March 3, 1993. Texas National Guard — 13. ATF officials conducted a briefing at the Best Western Hotel. Attending were members of the arrest and support teams, National Guard members, explosives specialists, dog handlers, and laboratory technicians. The sheriff's department saw to it that coffee would be ready for the raiders at the staging center on the morning of the raid (Treasury Report, pg. 79). Even the founder of the Special Operations commando group, the Delta force, was on hand critiquing the efforts of the first trial run of the National Response Plan. Col. Charlie Beckwith, an insider with Soldier of Fortune magazine, was not pleased with the ATF's efficiency. The Treasury Report says, "Colonel Charlie Beckwith, U.S.A. Ret., on assignment for Soldier of Fortune magazine, claims that he managed to advance on foot to within less than a mile of the Compound without being challenged." (Treasury Report, pg. 112). "Note: Beckwith was within one mile of the Mt. 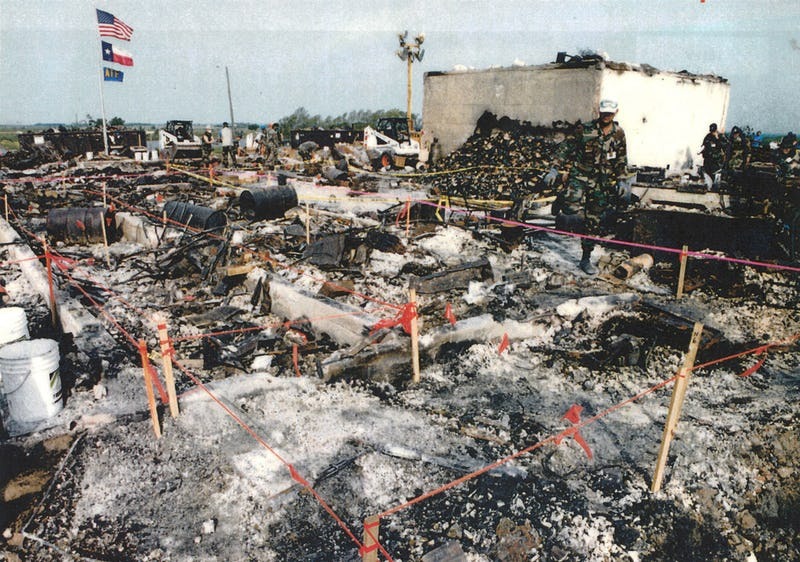 Carmel Center during hostilities, and he was not arrested — yet, several days after the fire in April — reporters from the Associated Press and Houston Chronicle were arrested for getting within two miles of the complex (see Inside the Concrete Room in the Death Gallery)". In an article appearing in the Soldier of Fortune, July 1993, Col. Beckwith also criticized the ATF's handling of the media. "It was not until the FBI arrived on 29 February (sic) that the media was put under control and moved outside the target area," he lamented. "At the central command post on the campus of the Texas State Technical College, officials set up briefing tents on the lawn. Hundreds of agents passed in and out of the barracks at the former military field, which includes an aircraft hangar and airstrip. "Just before 11 a.m., a number of buses and heavily armed ATF agents carrying plastic flex-cuffs left the base for the compound. Dozens of agents began carrying tables, chairs and stenography machines into the hangar, students and instructors at the college said. The first test of the National Response Plan went very well, it seems. State and local police, from the Texas Rangers to the local county sheriff's department cooperated with the federal government. The news services conducted almost no independent investigation whatsoever, and faithfully relayed the government propaganda line. In other words, the media covered Waco in the same way they covered the Gulf War (see Veracity of Contemporaneous News Coverage). Civic organizations — from the American Civil Liberties Union to the Southern Baptist Conference — barely made a whisper of protest or opposition. The politicians in Washington DC conducted cover-up Congressional investigations (see Burial Gallery). A police squad never flies a flag over the bodies of men, women, and children whose lives the police has failed to save. But a military unit will commonly raise a flag over people it has successfully conquered or killed. Photo, DallasNews, Feb 27, 2018. Click to see full size. Aside from a few glitches, some of which you will read about in this Museum, the National Response Plan drill came off very well. It's too bad so many innocent Americans died as a result, of course, but those that died were not the ones making the money. It's just a question of being in the wrong place at the wrong time, as opposed to being in the right place at the right time. In the military takeover of a country, paradigms must be established, from which the people can learn that resistance to the new order can only result in annihilation. With the practical details embodied in the National Response Plan, the new paradigm was established in Waco, Texas in 1993. 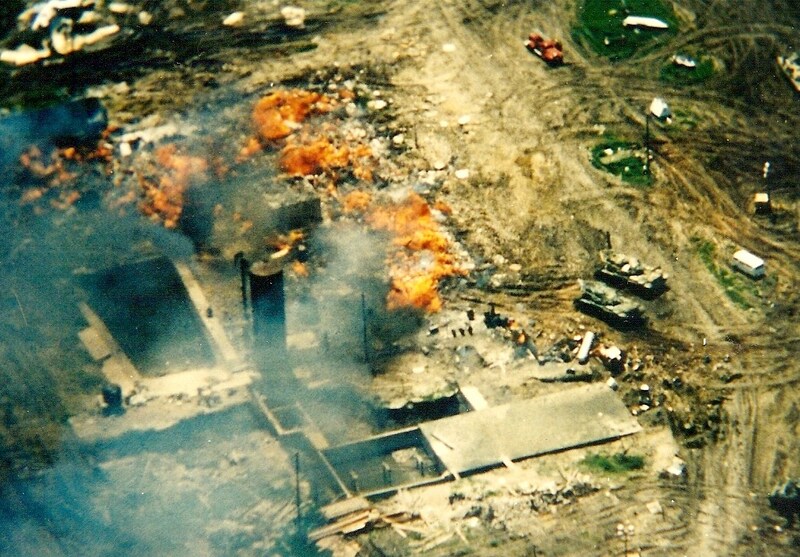 Since the Waco Holocaust, the US military practice sessions have become even bolder. 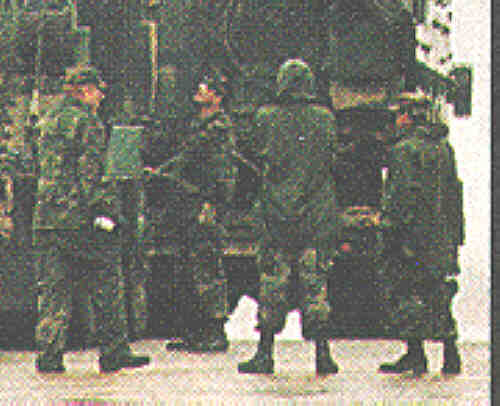 The Pittsburgh Post-Gazette, June 5, 1996 reported that "urban environment" warfare exercises have been conducted in a number of US cities, including Atlanta, Chicago, and Dallas. Most recently, Special Ops exercises in Pittsburgh provoked considerable negative public reaction. According to the Pittsburgh Post-Gazette report, between midnight and 2 a.m. on June 4th, 200 Special Ops commandos buzzed the city with Black Hawk helicopters, slid down ropes to the streets, and landed in the Brighton Heights area. They fired loud explosions and fired blank bullets for sound effects, and set off small explosions to breach doors in an abandoned building. Department of Defense Spokesmen said they were simulating a "rescue." Notice the same Orwellian rhetoric used in Waco: This is not an assault, this is a rescue. According to another report, one startled resident said, "If I had been up on my third floor, I could have touched it "the helicopter" with a broom handle. That's how close it came." The 911 emergency operators were given handouts instructing them to tell panicked callers they were witnessing "training" exercises. Callers who would not be placated were to be given another telephone number which connected them to the DOD. 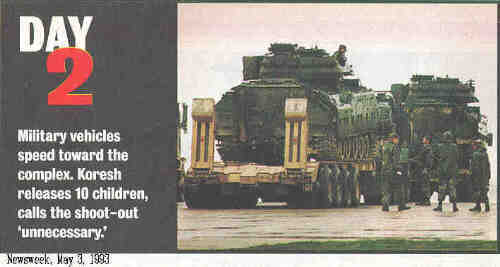 Some local officials had been warned of the exercises, and indeed helped in setting them up. But the public had deliberately not been warned, ostensibly to avoid the public safety issues created by curious onlookers. These exercises are, in part, mass desensitization sessions, the object of which is to dull public reaction to the sights and sounds of military takeover of urban areas. See "The Making of a Commando" in The Black Army for a description of desensitization programs. Visitors who have read The Boy Who Cried Wolf may remember what the young shepherd with a warped sense of humor learned: If you fake a wolf alert too often, people stop coming when you cry wolf. Now the wolf has learned the trick: Its only a drill, a practice session, I'm here to rescue you. Go back to sleep. These practice sessions will enable the Pentagon to send a flotilla of military helicopters over any major city, day or night, land soldiers in the streets, set off guns and explosions, breach doors with grenades — and people will ignore them. Paul Revere may ride, but we will ignore him, too. We all know the British are just maneuvering and practicing their skills — they are just here to rescue us.